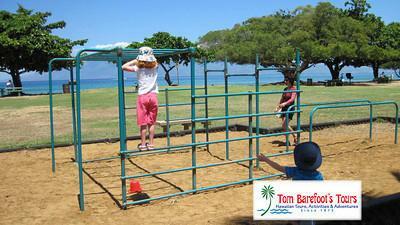 Honokowai Beach Park is undoubtedly the focal point of activity in the town of Honokowai. Anyone driving through the beach community of Honokowai will get their first glimpse of the ocean when they drive by the park on the Lower Honoapiilani Hawaii. As the name implies, Honokowai Beach Park is both a beach and a park. The large expanses of lawn with picnic benches and barbecues make it an ideal choice as a place for groups to gather in a park setting. The beach is available right there as well and is a popular location for Honokowai residents and visitors to frequent for a refreshing morning or afternoon dip. Honokowai Beach is unusual in that it is a combination of both sand and carved rock with reef somewhat further out. During low tide you can easily see the beach's rock bottom which will completely drain to provide a surface almost like a sidewalk. The sculpted rock base will lead eventually to the coral beyond which lies in a fairly shallow setting. Honokowai Beach is by in large fairly mellow and on days when the surf is not too large can make an ideal location to enjoy beach time with the little ones. The fact that the showers and bathrooms are in such close proximity also makes it an ideal choice for the use of children. Honokowai Beach Park is also one of the few beaches on Maui that has swings and monkey bars available for children to play on. There is so much in this beach park that appeals to children that it is a rare day when you arrive and do not see a mother pushing a stroller or observe children pushing each other on the swings. Amenities at Honokowai Beach Park are many. There is plenty parking just in front and if the lot is full you can find parking right on Lower Honoapiilani Road. There is a large bathroom facility with adjacent shower. Picnic benches abound and most of them are located right next to a barbeque. For the children you will find playground apparatus. There are many areas to find shade as well as direct sun and there is a large area of lawn suitably large enough for a touch football game. My dog LOVES this beach! Lots of volcanic rock to climb on, there's usually kids and other dogs to play with. Great place to have a picnic.